White Chocolate Bunny Ears: Swing Out Sister. Somewhere Deep In The Night (2001). Swing Out Sister. Somewhere Deep In The Night (2001). 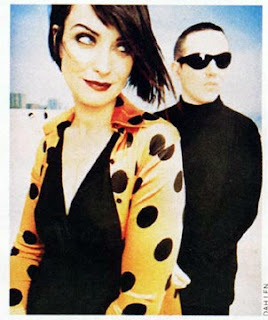 Swing Out Sister occupies a singular niche in the 21st century. Their somewhat outmoded style is reminiscent of the deliberate and carefully arranged pop songs of the early to mid 1960's taken from movie soundtracks of the time, songs that would have appealed to one's parents, who would have been otherwise annoyed by the clattery "noise" of the rock 'n' roll hits on the radio. SOS's experiments with odd meters and swing tempos, harpsichords, tympanies, string orchestras, and background choruses remind one of the work of composers such as Burt Bacharach, Henry Mancini, and John Barry, with the hipness of Quincy Jones. They started out as a trio 22 years ago with two ex-members of A Certain Ratio and a fashion student with a most distinctive throaty voice. They had a hit with the endearing "Breakout" in the States in 1986, a bright, propulsive and spunky jewel of a tune. Attention in the States and the UK began to decline, until they reached a low-profile cult status. But they became so big in Japan they were signed to the Japanese division of Mercury for years, so some of their records were not even released in North America. Over time, their music has begun to slow down, turn moody and veer into cinematic storytelling. Corinne and Andy became a duo of mature hipsters rather than young pop icons, the kind of couple that doesn't stay at the most expensive hotel, but the coolest, most secluded one. Somewhere Deep In The Night, their superb cd from 2001, is perhaps the best of their work released in this century. Neither blues nor groove oriented, the melodies arch and spin, with leaps and colorful non-chord tones. They have not abandoned rhythmic interest, but their songs mostly seduce with a rich harmonic language, the chord progressions continually refreshing themselves with surprising twists, displaying almost a Wagnerian delay of resolution. So, what's the problem with SOS? Way too jazzy for pop, too pop for jazz, and too complex for even "smooth jazz." Last year, Saint Etienne signed with Savoy Jazz as their North American label. SE is an indisputably brilliant group, but have not a shred of jazz in their work. Savoy would be wise to pick up Swing Out Sister and do them, and us, the same favor.